In my head is a list of female writers who inspire and fortify me when life gets to be too much — too harried, hectic, boring, busy. When I feel adrift, I cling to them like a life boat, mentally running through what I know about these women, and always taking note whether or not they’re mothers. I’m comforted by the knowledge that these aren’t uncharted waters, but have been crossed before by authors I admire and love. Louise Erdrich has a similar list in her book “The Blue Jay’s Dance,” which chronicles her life as a writer and new mother. Jane Austen — no children. Charlotte Bronte — died of severe morning sickness. Harriet Beecher Stowe — children. Louisa May Alcott — adopted a child. Alice Walker, Alice Munro. Children. Joan Didion. Children. Madeline L’Engle and Anne Murrow Lindbergh. Children. Sandra Cisneros — no children. Barbara Kingsolver — child. I hadn’t read Erdrich, but following the interview I picked up “The Blue Jay’s Dance” and “Love Medicine,” a novel that is a sad, cruel and beautiful portrait of Native American families. What I found interesting were the seeds of real life that Erdrich planted into the novel. This ability, to let fiction take root in fact and blossom, is a struggle for me. Erdrich wrote in long-hand with a baby in her arms, not just once, but for years, through dozens of books and three babes. Harriet Beecher Stowe wrote at the kitchen table. Madeline L’Engle at a typewriter with her family nearby. What it takes is the ability, the determination, to see what is possible. 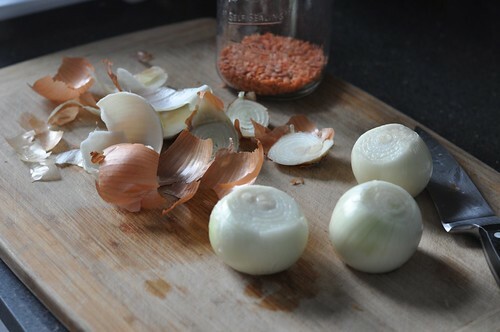 As I saute onions, I think about writing. Between stirs, I jot down observations, ideas, bits of conversation. This isn’t trance-like writing, the kind where I forget myself, the writing that is pure inspiration, a gift from my muse. Honestly, I’m embarrassed to share the stuff written in my notebooks because it’s just one word awkwardly placed next to another, messily written and food-splattered as I keep the lentils from burning on the stove. You will have an opportunity. 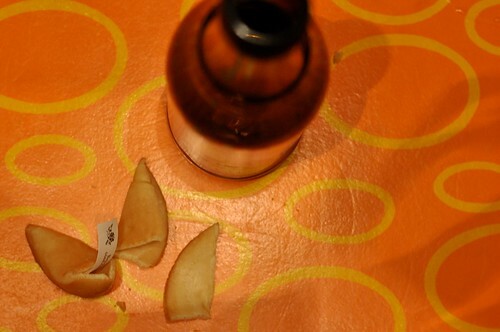 After dinner, we finish off the fortune cookies. Mine holds what I know, but need to be reminded of, that there is time, that somewhere in the swirling daily roil are moments to be discovered and claimed. I don’t need a room of my own; I have a notebook and pen. Life doesn’t need to stop, but can continue around me, like a rock in the middle of a river engorged with snow melt. And then, in the middle of this paragraph, what happens? I’m interrupted by my children who want, demand, desire, need me, and my thought, my sentence are forgotten as I’m carried off in the swift current. I resent them. I resent Marcel. I think life is grinding me down like the rock eroding under rushing water. Buoyed, I return to the computer and pick up where I left off. Heat oil in a skillet over medium high heat; when it’s hot, add onion and cook until it begins to soften. Add ginger, garlic and cloves and saute for a few more minutes. Set aside. Meanwhile, put the lentils in a soup pot, cover them with an inch of water and bring to a boil. Adjust heat so mixture bubbles gently and cook, stirring occasionally and adding water if needed, until lentils are tender, 15 to 20 minutes. Add the onion, garlic and ginger, salt, pepper. Pour a little more oil in the skillet and cook the mustard seeds until they begin to pop. Add them to the dal, too and keep cooking until desired tenderness. Lentils should be saucy, not soupy. Remove cloves. (I couldn’t find them.) Stir in butter. Taste and adjust seasoning, then garnish with cilantro, yogurt and caramelized onions. Serve. Hello there. I've missed reading your thoughts. It is nice to return. Balancing priorities, it is a constant struggle. 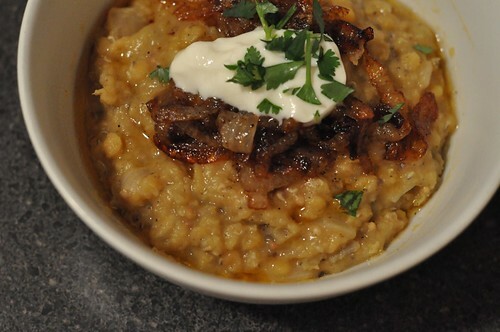 Your dal looks nice. Sometimes a little quiet time chopping, dicing, slicing helps me put things in perspective. I love the Blue Jay's Dance–I immediately though of the chapter "Roses, Spiders and Lists of Writers" (or something like that) while reading your first paragraph. Writing while cooking is a good idea…I've been waiting for a long time for a big chunk of (silent) uninterrupted time…I think I'll be waiting for that forever, so may as well write and cook. And, coincidentally, I was just looking at a recipe for red lentil dal to make tonight or this weekend. Andrea, that chapter resonated the most with me, so I went back and tweaked the post hoping to make it clearer. I keep hoping that one day I'll have that block of time to go back, read my greasy notebooks and surprise myself by discovering something valuable there. Enjoy your dal! Lovely list of writers, and your dal sounds delicious (dal-icious?) Reminded me of Laurie Colwin, who once said something like "lentils never disappoint" and she was right; maybe another writer who could go on that list. One more thing. I have Erdrich's book Shadow Tag on my to-read list. You probably know about it already, but if not, I thought it might interest you. The summary I saw read "Chronicles the emotional war between Irene America, a beautiful, introspective woman of Native American ancestry, struggling to finish her dissertation while raising three children, and her husband Gil, a painter whose reputation is built on a series of now iconic portraits of Irene." Thanks, Denise. I'll take a look. Anno, I haven't read Colwin, but will look for her books. Thank you. Laurie Colwin is a good writer to discover. She wrote novels about interesting women, which I like just fine, but I especially love her essays on food/cooking that she wrote for Gourmet magazine (collected into two books: Home Cooking, and More Home Cooking). A curious thing: I don't actually like most of her recipes, but her essays have the effect of an inviting conversation; they encourage me to write my own response, to explain how I would approach a particular meal or menu. She always seemed like the kind of person who would appreciate hearing someone else's perspective. Unfortunately she died 17 years ago or so, in her mid-40s, far too young. Thanks for this link — it reminded me that there are a couple of her novels that I still want to read. Plus, it gets at, for me, the strong appeal of her writing: the way she manages to be both great-hearted and sharply perceptive. I hope you aren't disappointed. Thanks, too, for your kind words at my blog. The tensions in the various corners of my world seem to be resolving, and I am grateful for the Sterkte I found in my friends and family that helped me stay the course I needed to hold. I'm not sure that words make reality, but they sure help us see reality in different ways, and I appreciated the perspective offered by yours.